THIS WARM SEASON HYBRID BERMUDA IS GREAT FOR USE ON ARIZONA LANDSCAPES, GOLF COURSE TEES and FAIRWAYS, LAWN BOWLING GREENS and TENNIS COURTS, PARKS and SPORTS FIELDS. Tifgreen 328’s wide range of mowing heights, and low, dense growth habit make it one of the most versatile hybrid bermudas, and thrives in the warm heat of Arizona. Tifgreen combines very fine texture with beautiful green color. It overseeds well, and has fewer pest and disease problems than cool-season grasses. 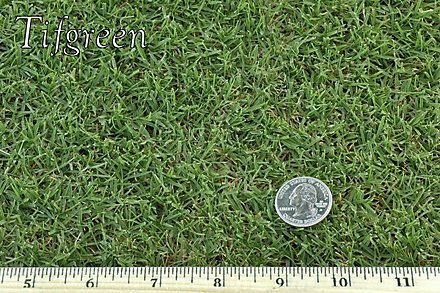 Like all our hybrid bermudas, Tifgreen 328 is a drought tolerant grass, and requires very little water compared to cool season grasses like fescue. Regular sod: 16” x 72” long rolls with ½” of soil. Weighs approximately 45 lbs. Ideal for normal situations. Big Roll sod: 42” x 105’ long with ½” of soil. Weighs approximately 2000 lbs. Great for large areas. Thick-cut sod: has up to a 2” soil base that provides anchorage for the sod until the roots knit to the subsoil. Ideal for renovating a sports field that needs to be back in play within a few days. Overseeded sod: Perfect for fall-season installation. No need to overseed! Stolons: Sod is shredded and broadcast like seed on a prepared bed. Installation is easy and inexpensive. Available May-September.